Save on your next flight from FEZ to SYR when you book through Travelocity. Need a last-minute flight to Syracuse? Travelocity offers discount airfare no matter when you book, even on popular routes such as Saiss Airport to Hancock Intl. Airport. Whether you need a direct or indirect flight, you can trust Travelocity to provide you with the best prices for FEZ to SYR flights. Situated in North Syracuse, this hotel is within 9 mi (15 km) of Hopkins Road County Park, Destiny USA, and Landmark Theatre. SUNY Upstate Medical University and 5 Wits Adventure are also within 9 mi (15 km). Situated near the airport, this hotel is 0.4 mi (0.7 km) from Brooklawn Golf Course and 2.4 mi (3.9 km) from Palace Theater. Landmark Theatre and Le Moyne College are also within 6 mi (10 km). 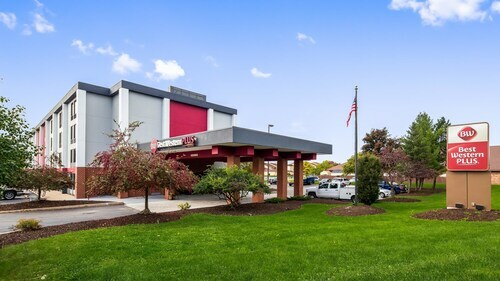 Just off Interstate 90, this East Syracuse hotel is about 7 miles from Syracuse University, the Carrier Dome, the Oncenter convention/sports/entertainment complex, and the Carousel Center Mall. Situated in East Syracuse, this hotel is 1.9 mi (3 km) from Brooklawn Golf Course and 2.9 mi (4.6 km) from Palace Theater. Le Moyne College and Shoppingtown Mall are also within 6 mi (10 km).